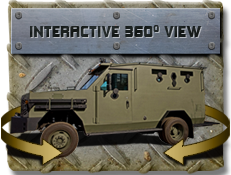 The BATT-S was specifically designed for law enforcement agencies that were hindered by budgetary constraints, yet were still in need of an armored personnel vehicle for their tactical teams. Our BATT-S has quickly become an indispensable tool to many agencies around the country, who once thought they could not afford an armored tactical vehicle. Starting under $100,000, our NIJ III Rated BATT-S allows for an economical solution to the increasing violence problems that plague many of our law enforcement agencies. The BATT-S offers a Tested and Recommended APC which boasts all the same deployment and operational abilities as our BATT, for a fraction of the cost. Due to the law enforcement community’s requests, we have now engineered our BATT-S to accept our NIJ IV and .50 caliber protection packages. This unit is called our BATT-S AP and allows agencies to acquire the same armor protection level found on our BATT vehicle at an affordable price. More officers to scene; more room to move, increases overall comfort level, additional space for hostage negotiators etc.